On October 13th, at 3.30 pm, Trans-Australia Airlines' Series 720 Vickers Viscount VH-TVA John Batman landed at Essendon Airport, Melbourne, Australia, after a delivery flight of 12,080 statute miles. 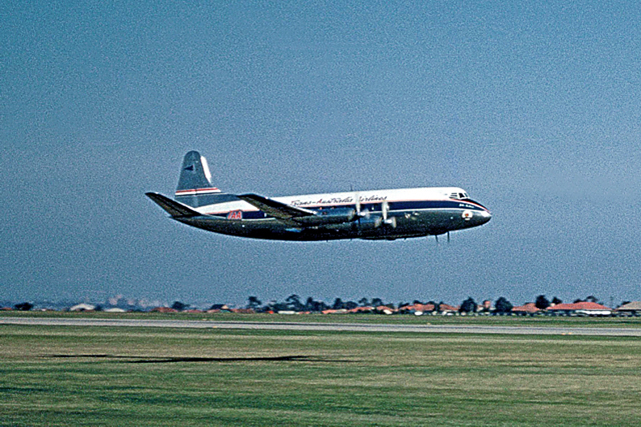 This delivery flight marked the beginning of a new era in aviation for this continent, because not only did it bring to Australia its first turboprop airliner, but the Viscount was also the first large British airliner to be delivered to Australia for twenty years. 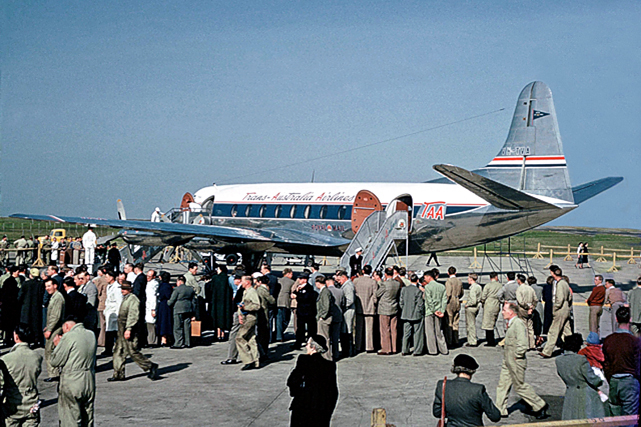 It was another step along the road for TAA, who had planned for three years to introduce this aircraft to Australia, this company, being actually the fourth definite customer Vickers had for the Viscount (the first three were BEA, Aer Lingus and Air France), and its performance and reception more than justified the faith evinced in the aircraft by Mr J L Watkins, TAA's director of engineering, when in 1951 he recommended the purchase of the model 720 by his management. The TAA specification for the Viscount 720 was such that this series differs greatly from the 700. In point of fact, flight and acceptance trials of the 720 became the proving ground for the majority of the new features Vickers are introducing into the new Series 700D. The delivery flight was planned to leave London Airport on Wednesday, October 6th, with VH-TVA scheduled to rendezvous over Melbourne with a photographic aircraft at 2.55 pm on Wednesday, October 13th; and the flight operated to such a schedule that VH-TVA actually arrived over the rendezvous 11 minutes early. The personnel concerned with the delivery flight were: Flight commander, Captain F Fischer; 1st officer, Captain D Winch; navigator, Captain H Locke; radio officer, R/Off. B Roberts; and flight engineer, Eng/Off. S Banks. Seventeen passengers were carried, eleven being TAA personnel: Mr J L Watkins (director of engineering) and Mrs Watkins; Mr J G Dailey (planning and performance engineer); Mr E F Coate (radio engineer); Messrs Buncle, Phillingham, Berrie, Kirk, Taylor and Dunn; and Mr G Thompson (film producer and cameraman). The remaining six were Mr R Simmonds of Rolls-Royce; Messrs C Spooner, R Shaw, and J Gunn of Vickers-Armstrongs Ltd.; Mr J Tupman of Normalair; and Mr E Birchill of Rotol. From a mechanical aspect, the flight was a complete success. Every one of the 56 engine starts was faultless, and the only mechanical faults experienced were an incorrectly set flap adjustment prior to take-off and a faulty windscreen wiper en-route. As the delivery flight was to be through the tropics, where many landings and take-offs would be made at high aircraft weights and high ambient temperatures, complete performance studies were made by Messrs Watkins and Dailey during the journey; and the results exceeded the most sanguine expectations of Vickers and TAA. Although the Series 720 aircraft is cleared to 60,000 lb all-up weight, the fully loaded weight of VH-TVA on its delivery flight, with full tanks, amounted to 58,800 lb. At this figure, mid-day take-offs at Athens, Bahrein, Delhi, Bangkok, Djakarta and Den Pasar under high temperatures were accomplished without using more than about half of the runway length available. following its epic 7 day delivery flight from the UK. Performance records of the flight and observations made en-route have been summarized, and Tables I and II give the complete picture of the results. It can be seen that the performance exceeded the best hopes of the Vickers planning staff. Passenger reactions during the flight were such as to prove the suitability of the turboprop aircraft for Australian travel. Despite the lack of sleep during the overnight stops (much of the time was spent in sightseeing and souvenir purchasing), the passengers remained wide-awake and active throughout the whole trip - so active that Captain Fischer, when responding to the speeches of welcome at Essendon, referred to the constantly changing trim of the aircraft, caused by the exuberance of the cabin occupants. TAA are satisfied that the appearance, facilities and comfort of the 44-seat cabin will surpass anything now offered in Australia. The new Normalair pressurization and air-conditioning system proved highly satisfactory throughout all varying air and ground-operating conditions, and its performance showed that it can be expected to provide maximum passenger comfort on TAA's domestic routes. The company-planned radio installation worked perfectly throughout the flight. Long-range HF radio-telephony and VHF were used throughout and not once was it necessary to revert to CW operation. VHF communications were excellent, 5 x 5 reception conditions at 250 nautical miles being the normal experience on every leg and between Alice Springs and Melbourne; a trial call to Adelaide from 420 nm at 15,500ft gave a strength report of 3 X 3. From the passengers' viewpoint, this ferry flight presented what has probably been the most comfortable air journey ever made from England to Australia. Every night was spent on the ground at an interesting city and every mid-day meal was served on the ground at an airport terminal. Customs and other transit facilities were all handled most expeditiously, and flying concluded each day at an hour which generally allowed adequate time for sightseeing and shopping. During the whole trip there were only two occasions, of about two minutes each, when turbulence was experienced - and one was man-made, when Captain Fischer took the Viscount over the Equator with appropriate control movements. This was for the benefit of Messrs Tupman and Birchill, whose first crossing was celebrated by their being crowned with pineapple rinds and presented with certificates. A day's stay-over was made at Darwin so that the aircraft could be checked and cleaned. Here TAA’s assistant general manager, Mr J P Ryland, and the Director of Operations, Captain J Chapman, joined for the flight to Melbourne. After the arrival of VH-TVA at Essendon, work immediately began on the installation of the Australian designed and manufactured buffet equipment, and this work was completed within three days. Flight training then proceeded and the programme was so satisfactory that the first paying-passenger turboprop flight in Australia was made on Thursday the 21st - within eight days of the delivery. Passenger reaction was such as to justify completely TAA's faith in the Viscount. Mr G Thompson, the film expert, had stayed with the TAA engineering party at Vickers’ Hurn factory throughout the final manufacturing stages and flight acceptance trials, covering the various activities for a documentary film and newsreel; and during the ferry flight he photographed scenery and recorded the activities of all on board. It was expected that in due course TAA would be able to make copies of this film available at their London office. Editor's Postscript. - It will be remembered that VH-TVA was destroyed in a training accident near Melbourne less than three weeks after delivery. 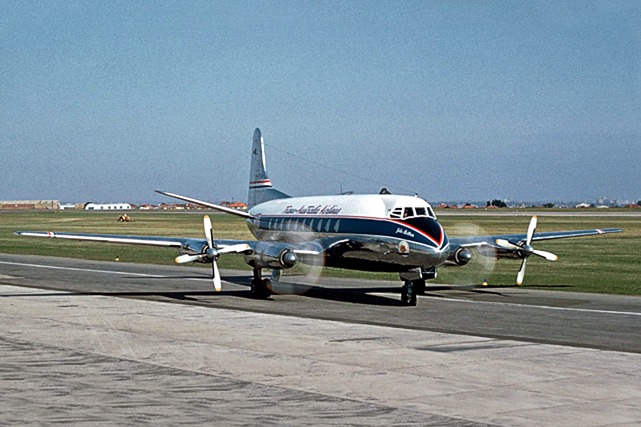 The second and third aircraft, however, are now in Australia, and TAA's Viscount services on the Melbourne – Sydney and Melbourne - Brisbane routes were due to be in operation by Christmas. The fourth Viscount was to have left Hurn for Melbourne last week-end, and delivery flights of the fifth and sixth machines are scheduled for January and February. The sixth of TAA's Viscounts, incidentally, will be the first to have Dart 506s and external slipper tanks, and the fifth has built-in provision for the extra tanks. * Times include diversion to Agra, descent, and two photographic circuits of Taj Mahal at low level. # Includes 30 min demonstration flight at 10,000ft and two aerodromes passes. Actual time from take-off to over Essendon Airport was 3 hr 55 min. ^ Average equals 287 gal/hr. * Observations doubtful near cumulus clouds. 260 kt = 300 mph.